We just recently finished our living room. It has taken us an eternity, but it finally feels homely! 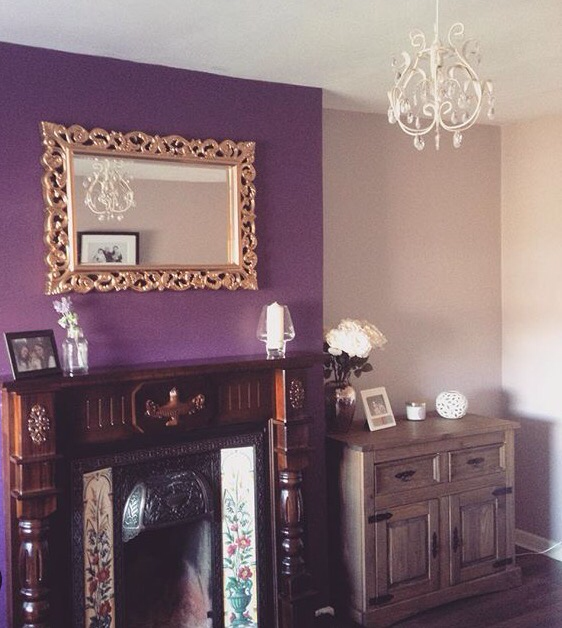 Here is a bit of inspo for anybody who might be interested in a purple, gold and cream colour palette for their living room. We chose the shades Dulux Ashbury, a pale mauve colour, and contrasted it with the vibrant Dulux Film Noir on our feature wall. 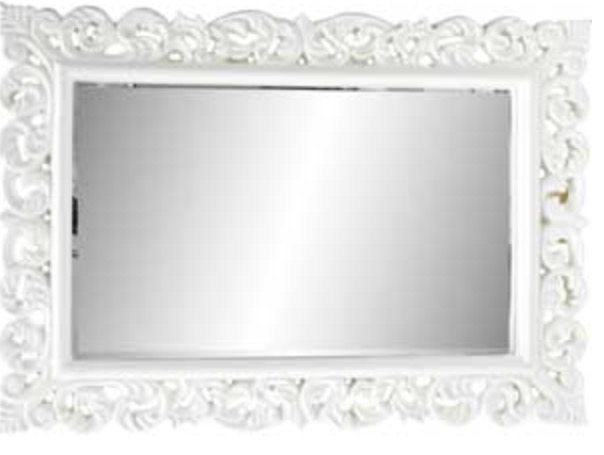 We found it so difficult to agree on a mirror for over our mantle, but we bought this Heart Of House Isabella mirror, in cream, from Argos. We sprayed it with Halford’s Gold Chrome spray paint, which is suitable for use on plastic, wood and metal. The finish is so ornate and authentic looking, and it didn’t even require a primer! 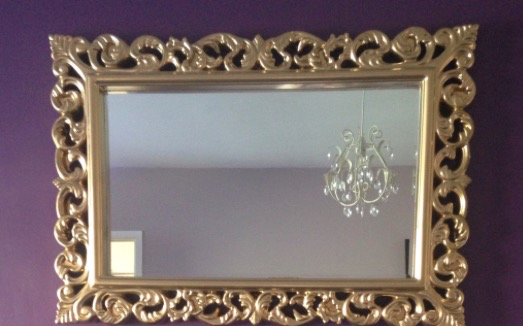 The mirror was cheap as chips to buy, and looks quite expensive now that it’s finished and taking centre stage in the room. I swear by Argos for good quality, inexpensive home things and furnishings. Our units, light shade, lamp, mirror, picture and purple cushions were all purchased there. 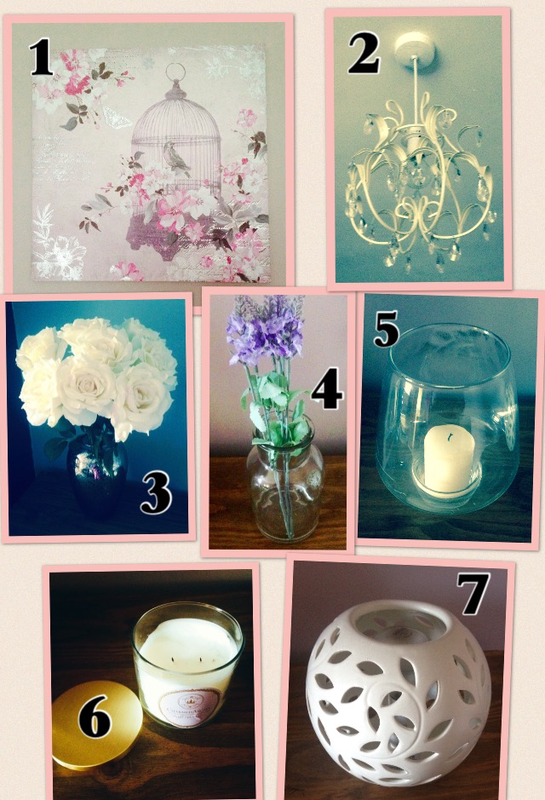 The faux roses are from Dunnes and the champagne bubble vase is Next. And we picked up the glass votive and mason jar on sale in Homefront. My friend gifted us this Charmed Aroma Sweet Pea Valley candle from Canada. I’m delighted with how the room has turned out. It’s simple, yet stylish at the same time. Have you done any decorating recently? What decor and colour schemes have you been loving? I’d love to hear your ideas!